The knowledge and care for the vineyards and wine that was vested upon Eva and Günter Müller by their family, has been greatly used for growing and cultivating grapes for three generations in the village of Gross St. Florian, near Graz in Steiermark, Austria. Hand-in-hand with their love for wine the couple embarked on a quest for greatness which can be seen in their work with spirits from all kinds of fruits and residues. Yes residues! Their vineyards are 35 ha in size and are almost entirely south oriented which results in a fantastic microclimate that is favourable for a healthy and mature crop. What is left from that yummy crop is used to make this outstanding Pomace, or Tresterbrand, as the German speaking distillers call it. 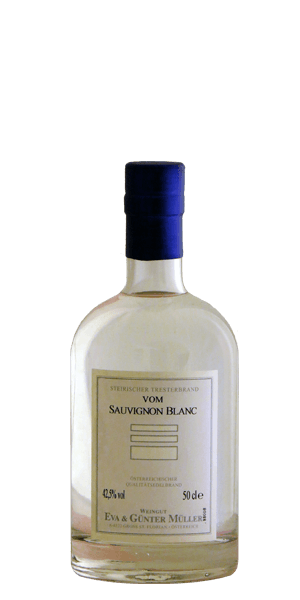 The Muller Tresterbrand vom Sauvignon Blanc is made, as the name reveals, from the Sauvignon Blanc type of grape. This Austrian Eau de Vie is unaged and packs a big fruity punch that delivers, just like Tyson once did! What does Muller Tresterbrand vom Sauvignon Blanc taste like? The Flavor Spiral™ shows the most common flavors that you'll taste in Muller Tresterbrand vom Sauvignon Blanc and gives you a chance to have a taste of it before actually tasting it. Dried grape pomace with citrusy tones tingling around. A citrusy flavour commences the flavour journey, then different spices and herbs become present also. Very dense, full-bodied closure that stays present and delivers!